May’s Ride of the Month story began in early 2007, with a search that lasted almost a year for a clean Silver or Gray 86Gt t-top. 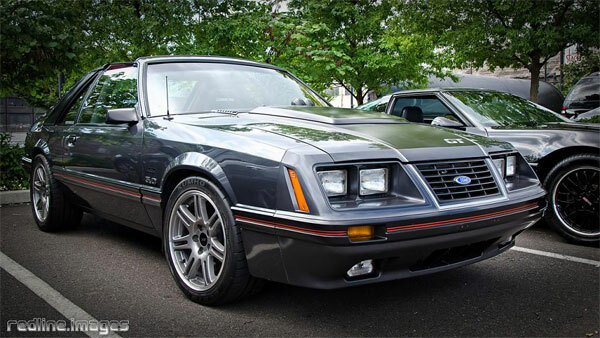 Ultimately, it ended in May of 2008 when an original owner, low mileage Dark Charcoal 84GT T-top was found in New Jersey. The car had been garaged its whole life and still wears it's original paint just exactly as its new owner wanted. The car was modified from stock in the late 80's and early 90's before a complete road course style build took place in the late 00's. The car had seen track time in the 90's and 00's with several wins at Wakins Glenn, Limerock, and Pocono. The well sorted out car has posted best times of 1:02.26 on Pocono N, 1:15 on Pocono E, 54.66 on Pocono S, and 1:08.43 at Limerock. Joe “Tormentor” has amassed a well documented history of the car over the years, including the original dealership paperwork. Joe has also been able to maintain a relationship with the original owner of this cool two owner car. The beautiful body work still retaining it’s original Dark Charcoal Paint is complimented with an OEM 1983 GT hood scoop and a Design Concepts cowl cover complete with Autometer gauges. According to Joe one of his toughest challenges is keeping that original paint looking new. 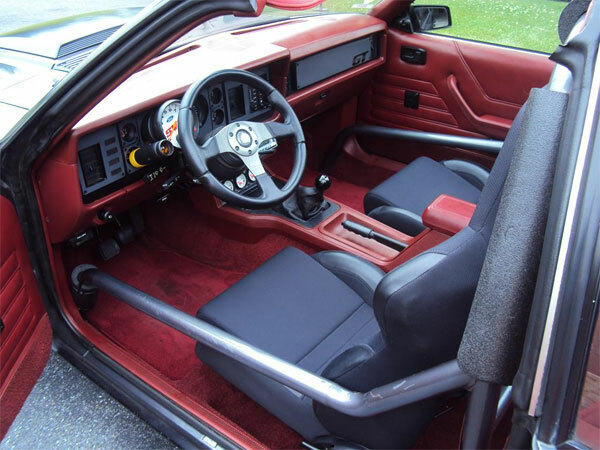 The custom interior retains the original Canyon Red color, but has been outfitted with Corbeau A4 seats, a Momo steering wheel attached to a Flaming River steering shaft that turns a Flaming River power steering rack, Autometer gauges, a rear seat delete, and custom S&W 6pt roll bar for safety. 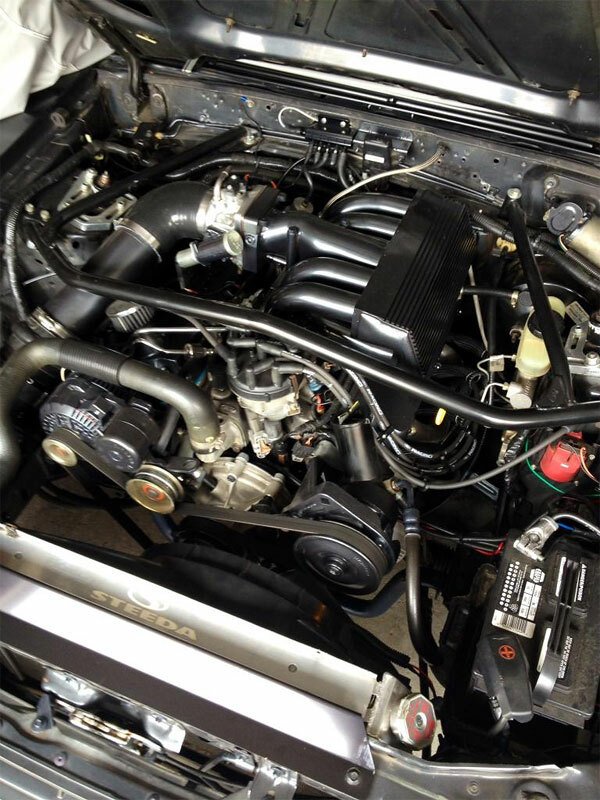 The expertly detailed engine is a 347 Ford Racing Sportsman short block stuffed with a Ford Motorsport F-cam, topped by a pair of Edelbrock Performer heads set up with 1.6 Roller Rockers, a GT-40 Intake, and Pro-M 80MM Mass Air metering all the incoming airflow. All this adds up to 331 RWHP and 359 RWTQ on the dyno. The powerful 347 is mated to a custom ratio Astro T-5 with a Fidanza aluminum flywheel and a Centerforce Dual Friction clutch. All of this is shifted by a Hurst Billet Shifter and transfers the brute power through an aluminum drive shaft to the 8.8 rear axle. The rear end is stuffed with 3.73 gears, a Ford Motorsport girdle, Fox length axles fitted with North Race Car brackets and FMS M2300K Cobra brake kit. The drive train is wrapped up with the deep rumble exhaust consisting of Bassani shorty headers, Bassani aluminum X-pipe, Spintech Pro Street mufflers, and Flowmaster tailpipes. The road racing inspired suspension consists of Koni double adjustable Yellow struts & shocks, Steeda Sport Springs, Steeda Rear Upper/Lower control arms, Steeda Bumpsteer Kit, Steeda sway bars, Kenny Brown panhard bar out back, Maximum Motorsports strut tower brace up front, and Kenny Brown subframe connectors to tie it all together. The finely tuned suspension rolls on Ford Racing 10th Anniversary Cobra wheels (17x9) wrapped in Kumho XS Tires sporting 255/40’s up front and 275/40’s in the rear. When straight line speed is needed the Kumho’s out back are swapped for a set of M/T 275 drag radials to plant all that power at the drag strip. 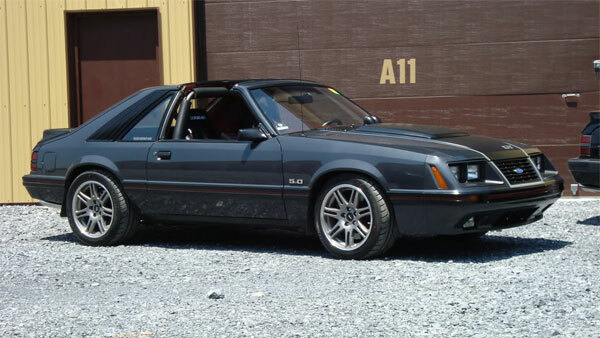 Having owned 20+ Mustangs during his life, this 84 GT is so beloved that it has a permanent spot in his stable due to the fact this is the most well rounded Fox Body Joe has ever owned. The fact that the 84 year model is his favorite doesn’t hurt either. Those of you lucky enough to be in the Pennsylvania area can see this car in person at shows & cruises throughout the year, where this beautiful GT has been awarded the Dealers Choice Award as well as several 2nd and 3rd place finishes in the NY/PA area. Beautiful car Joe. Really neat history as well. Congrats on the ROTM! Very well deserved. Congrats Joe. My favorite '84GT by far!!! Congrats Joe! This car deserves to be called "SIMPLY AWESOME"...very nicely put together! Congrats Joe! You still want to race? Congrats Joe! hope to see it again one day. Congrats Joe! Someday I hope to see this car too. That 82 GT is also quite the piece. Glad I got to see that one. God i love your csr!!!!! Congrats. 84 rocks!! !